We started off by reviewing all the countries we’ve learned so far, then worked on our mapping project. We discussed the Sahara desert, the Nile river and learned some cool facts about Egypt. We had a lot of fun activities this week, but one simple idea that was a HUGE success, was the scarab stone craft we did from Global Art. The kids went outside and gathered some nice smooth oval shaped rocks, then we used colored sharpies to color them. I still find these things all over the house! We learned about the Egyptian flag and colored our worksheet. We completed our Egypt mini-lap book to add to the world lapbook once we’re all done. Since Egypt was our last country in Africa, we did a review of all the countries we learned and colored them in on our review map. Of course a tour through Egypt wouldn’t be complete without learning about the Great Pyramid of Giza! We used FloraCraft Styrofoam Bricks to make ours. We learned that building a pyramid was harder than it seemed! I didn’t want to waste bricks by making full layers for each level, so we glued a couple layers then let it dry then glued a few more. This took forever, and our pyramid got a little deformed along the way! I don’t know how those Egyptians did it! And probably one of our favorite parts of the week came on Apple Mummification Day! The kids did a great job weighing their apples, then measuring their mixtures. Everyone was excited to see results! I’ll post those in a separate instructional post. At the end of our 7 days, we discovered that cup #3 with salt only was the best preserved apple in the bunch. Anything involving baking soda was horribly discolored and dehydrated! And that my friends wraps up our week on Egypt! Stay tuned as we head over to Australia next week! 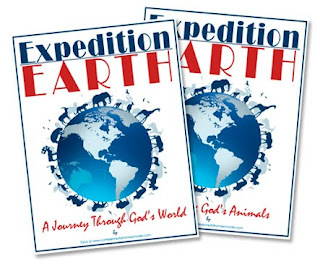 Click here to learn more about my Expedition Earth World Geography curriculum! This is great, I LOVE the mummification project. Are the activities that you do suggested in your Expedition Earth book? Thinking about getting it for for Kindergartener. I love your pyramid. We did one with sugar cubes and had a blast. 🙂 Hands on learning is so much fun. Egypt is also my favorite. Its really a good blog on Kids preschoollearning Photos . I appreciate your article. Its important to get advance method for kids to grow and learn faster. This blog is really helpful to give a light in this issue. So thanks for sharing all that important information.